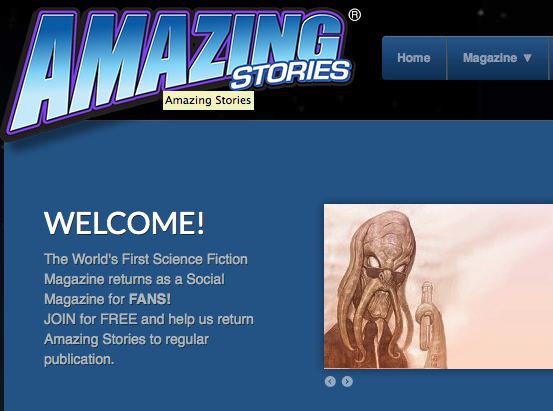 Steve Davidson and a team of 50 bloggers have relaunched Amazing Stories magazine as a community site for science fiction fans. April 1926 — Hugo Gernsback, publisher of Electrical Experimenter science magazine, launched the first magazine devoted to science fiction — or what Gernsback liked to call “scientifiction.” Amazing Stories was published for almost 80 years, passing through the hands of a wide range of publishers (including, in the late 1990s, Wizards of the Coast). It debuted writers including Isaac Asimov and Ursula K. Le Guin, but the magazine suffered from uneven leadership, uneven quality, and controversial editorial policies. It ceased publication in 2005. January 21, 2013 — Steve Davidson of Experimenter Publishing (note the company name) has re-launched Amazing Stories as a web community, with the goal of establishing a market that will enable him to revive the professional fiction magazine. Davidson, curator of the Classic Science Fiction Channel website and author of several books on paintball, spent three years obtaining the rights to the Amazing Stories name. He published two online issues of the magazine last year, as a proof of concept. “Every genre fan now has a chance to help support the creation of a new market for the stories, artwork, and articles they all love so much,” Davidson said in a news release this morning. At the core of the new site’s content are posts by a team of bloggers covering a wide range of science fiction-related topics. The site will offer product reviews, convention news and listings, and will take advertising. I have more than just a science fiction reader’s interest in the revival of Amazing Stories. I’m going to be one of the bloggers for the site, writing primarily (but not exclusively) about my explorations of science fiction-related communities including gaming, girl geekdom, the Maker community, Steampunk, Browncoats, Discworld, and SF/mystery crossovers. Please come join us at Amazing Stories.